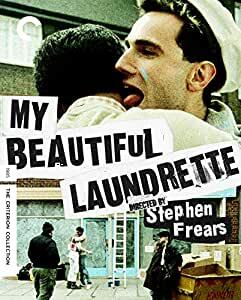 Amazon's Choice for "my beautiful laundrette"
London punk Johnny and Pakistani Omar redo a run-down launderette. Directed by Stephen Frears. Anything w/ Daniel Day Lewis is great. So is this particular movie. Touching and real. LGBTQ issues and much more. Love the story. Love how the movie ends. I’ve seen it 4 times now!! The acting is horrible. It sounds like the actors cannot talk in a normally. I understand that people like it for its topic and its depiction of the 80s. But as a film, this really isn't something worth watching. 5.0 out of 5 starsyou shouold watch this slice of life movie. Let's take a look at the cultural mores of the 1980's in South London as a young Pakistani man and a young London man fall in love. First lets look at the very understated story. wonderfully told and explores the Pakistani population of England and brings us into it. There is also the look at the prejudices that seem to exist everywhere. As we look into this story of the patriarch of the family giving his nephew a run down laundromat to work we see the lives and tribulations of the family and others. The very slow unfolding of the love between theses 2 very different men becomes the focal point of the movie. Does love conquer all? check it out. Stephen Frears has made some of the best films of our time, from high art like Dangerous Liasons to his tales of working class England. "My Beautiful Laundrette" is one of my absolute favorite films. I particularly enjoy seeing some of India's finest actors (the father and the uncle). Check out "Sammy and Rosie Get Laid" as well, which is a collaboration with the same screenwriter. This is a must-see film for anyone concerned with the plight of repressed human beings. Not only does the film expose the anti-Pakistani(dark-skinned) bigotry of the white lower-class Briton, it also expresses well the ambivalence most gay men still feel, especially in the lower economic strata of society where "a little knowledge" is indeed a "dangerous thing." However, it is also a powerful love story which surprises the audience with its youthfulness and yet its simultaneous maturity as well. Although the milieu is working-class Britain and middle-class yearning immigrants, it might just as well be filmed anywhere in similar socio-economic circumstances in the United States. The ending may be a little confusing to many, but careful attention and rewatching the film soon cures that malady.